Just wanted to let you know that this fall-flavored bite of bliss is sponsored by my friends over at Harney & Sons! 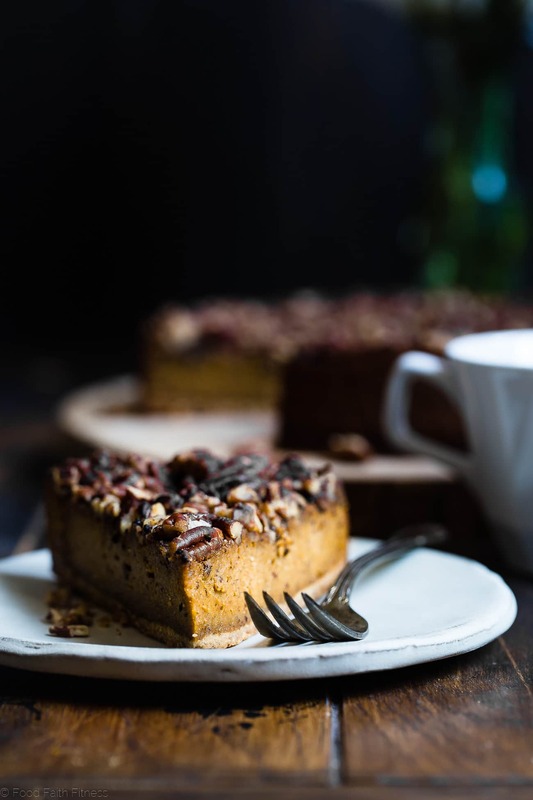 This vegan-friendly, gluten free pumpkin cheesecake is infused with spicy chai tea! It’s an easy, healthy and paleo friendly show-stopping fall dessert! 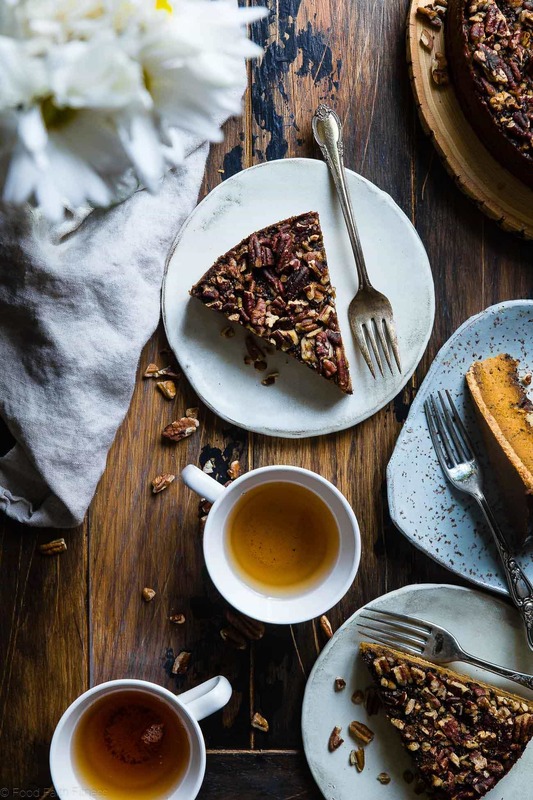 With its spicy-sweet-creamy-dreamy-ways, this little slice of fall-inspired heaven has got me like WHOA. Liiiiike, gimme a chunky sweater, cozy scarf and a warm blanket beside a crackly fire and just LEMME GO TO TOWN on a HYOOGE slice of super addicting cheesecake B-L-I-S-S.
Scratch that. Don’t give me a slice. The WHOLE thing and a fork will do. Cheesecake is one of those desserts that just always makes sense. Going to a baby show? MAKE A CHEESECAKE. Bad day at the office? CHEESECAKE won’t tell you to get over it. Getting married? WHY NOT HAVE CHEESECAKE? You get the picture. P.s. Fun fact: Mr. FFF and I actually broke a donut instead of cutting cake at our wedding. That’s not related to cheesecake. But, I felt it might enhance your life to know this ultra-fun tidbit about me. If you would have spoken to pre-blogging-pre-having-to-create-recipes-all-the-time-forever-me, I would tell you that, although it’s not the greatest food choice hungry-you could make, you should never mess with cheesecake. It’s supremely perfect in its combination of CREAMY cream cheese (duh) and sugar that sits on crispy-crunchy-crust. Preferably a gluten free graham cracker crust recipe. BUT, just like many things on this side of the internet (I’m looking at you Mexican zucchini lasagna and cauliflower tater tots) I MESSED WITH IT. 1. We can all agree that cheesecake that is made of real food, which allows us to feel VRY VRY good about our decision to eat 3 slices, is a good life choice. Mr. FFF loves the stuff and can’t do the “dairy thing.” #GoodWife. It’s not our first time ‘round the block with playing with dairy-free cheesecake. 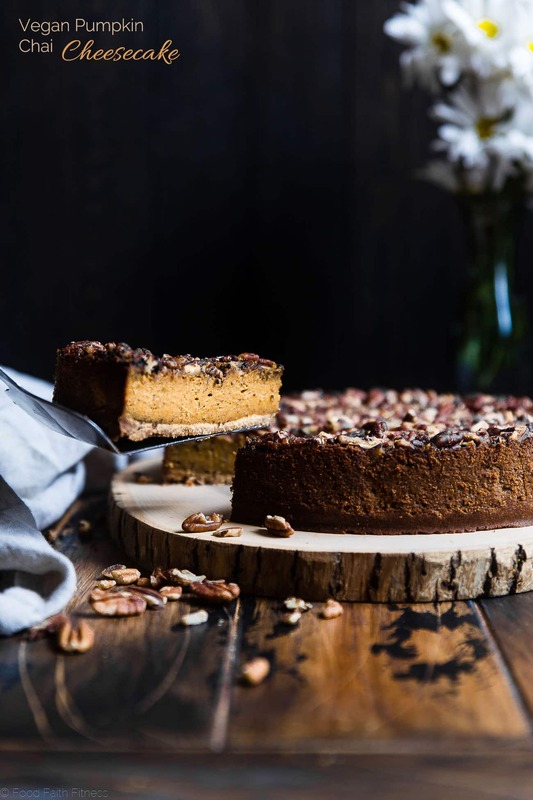 I mean, we’ve eaten normal low carb keto pumpkin cheesecake, but there has been MORE dairy free versions. We’ve eaten lemon turmeric vegan cheesecake and gluten free carrot cake vegan cheesecake B4. In these moments of our lives we learned the super-secret way to fulfill your real-life-person-cheesecake craving WITHOUT dairy…orrr eggs…OR any general questionable ingredients. Creamy, dreamy swirls of cashew cream dance around your taste buds with MORE nutty-flavor-profiles in the form of pecans, and glorious notes of cardamom, nutmeg, cinnamon, pumpkin spice AND CHAI TEA. Nestling into that cozy sweater RIGHT NOW. W-H-E-R-E to begin with the RIDIC amount of cozy feels that come from blending in Harney & Sons Chai Tea leaves, with they’re naturally smooooth, yummy vanilla notes? Can I be honest with you guys: I don’t even like pumpkin spice lattes. Come fall, hand me a steaming Chai latte and Imma be ONE HAPPY GIRL. So, uhhhh, hand me a pumpkin cheesecake (because I want pumpkin. Just not with coffee) with all of the spicy-sweet cardamom! Cinnamon! Nutmeg! Cozy chai feels baked right in, anddddddd I’ll be your very best friend for the rest of time we hang out in internet-land. Unless you try to make me share. Super simple, clean and natural ingredients. L-O-V-E that they come lose-leaf, and you simply have to pour water on top, let ‘em steep, and then remove them once optimal steep-age has occurred. They also come in bags too, if you’re more into that! They are a part of “1% For the Planet,” which allows them to donate 1% of total profits to environmental organizations of their choosing. Digging into a slice of Chai cheesecake W-I-T-H a chai latte on the side. THAT CAN BE YOUR LIFE. NOTES: Please read recipe carefully, as this does need to be cooled overnight! 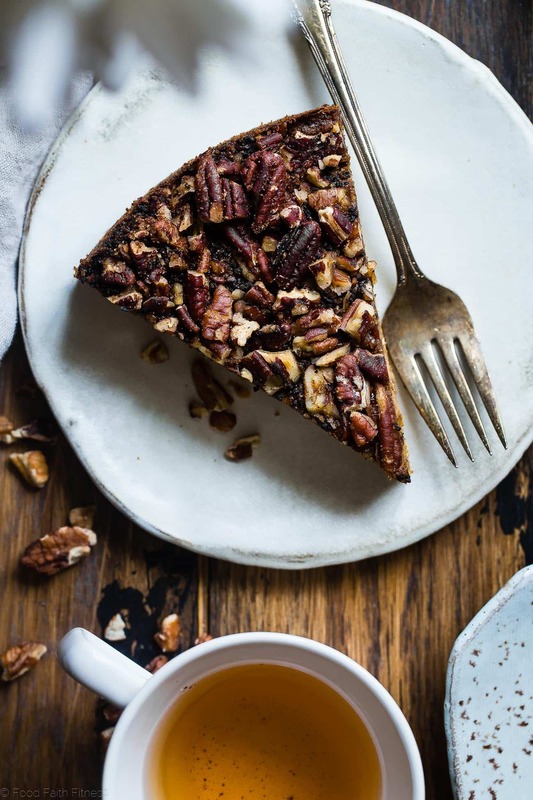 Heat the almond milk in a small pot and put the tea (for the cheesecake) into a mug. Once the almond milk is hot, pour over the tea, stir, and let steep for 15-30 minutes. Once the tea has steeped, place the flax meal into a small bowl and pour 7 1/2 Tbsp of the warm almond milk/tea mixture ***(leaving the tea leaves at the bottom of the mug) over top. Whisk until well combined and then place into the refrigerator to gel up while you make the other layers. Add all the "topping" ingredients into a small food processor (mine is 3 cups) and pulse until the nuts are broken down, but still a little chunky for texture. Set aside. In a large bowl, beat together the coconut oil and honey for the crust, until smooth. Stir in all of the remaining ingredients until well mixed. Your dough will be quite wet. Press the dough evenly into the bottom of a 9 inch Spring form pan. Since the dough is quite wet it might take a little bit of time, so just be patient. Bake until the edges of the crust are lightly golden brown, about 7-8 minutes. 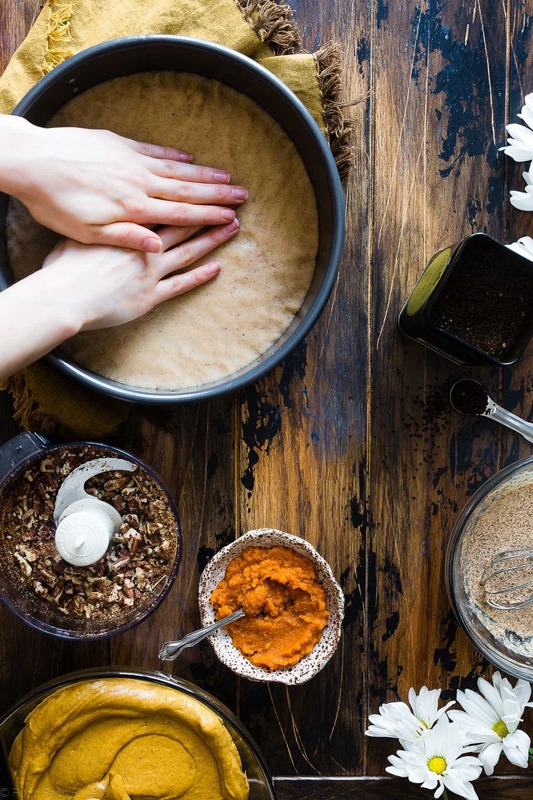 When the crust has about 2 minutes left to bake, transfer the cashew mixture into a large bowl and pour in the flax eggs from the refrigerator. You want to leave them into the refrigerator as long as possible, so they can really gel up. Stir until the flax is evenly mixed into the cashew cream. Remove the crust from the oven. Your crust with most likely have risen in a few spots. Just use a small spoon to quickly pack it back down flat. Immediately pour the cheesecake mixture over top and smooth out evenly. Finally, sprinkle the pecan mixture over top, and lightly press it into the cheesecake to adhere it. Bake until the cheesecake has risen slightly and it feels set, about 45 minutes. Remove from the oven and let cool completely on the counter. Then, cover and refrigerate overnight to completely set. *I buy my cashews pre-roasted. If you're aren't, stick them in a 400 degree oven for just a few minutes, until lightly golden brown. **I've made this crust with different brands of coconut flour and, to get 66g, some brands need less than 3/4 cup. So, I STRONGLY urge you to weigh your flour to make sure you get perfect results. ***It needs to still be warm. So, if the tea is cold zap it in the microwave for a few seconds. **** You need to pour the cheesecake over the crust as soon as it comes out of the oven, so it's best to make it first. *****It can be a little difficult to get the first piece of cheesecake out. Just make sure your getting your knife under the crust, not between the crust and cheesecake. An offset spatula really does the trick for serving here! THIS POST IS SPONSORED BY MY FRIENDS AT HARNEY & SONS. THANK YOU FOR ALLOWING ME TO CONTINUE CREATING GREAT CONTENT FOR YOU BY SUPPORTING PARTNERSHIPS WITH SUPER-FAB BRANDS THAT FOOD FAITH FITNESS LOVES TO WORK WITH! AS ALWAYS, OPINIONS REMAIN 100% MY OWN! STAY IN DA KNOW ABOUT BEHIND-THE-SCENES INFO GOING ON AT FFF BY KEEPING IN TOUCH ON TWITTER,FACEBOOKAND PINTEREST! YES! I am genuinely in love with this recipe idea, Taylor! Seriously, you took the words right out of my mind with everything you said about chai and pumpkin spice lattes. 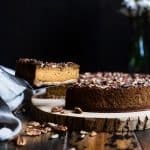 Oh, and using cashews for a vegan version of cheesecake is something I’ve been so curious to try because I’m actually not a huge fan of dairy (Except Greek yogurt <- obsessed!) so I have to try this! Thanks Taylor, and btw I think donut breaking is the most brilliant wedding tradition ever! I am SO glad it’s not just me!! You totally need to try cashews girl. They are SO much better than cream cheese!! Totally in LOVE with it! You have a way of making healthy food look delicious! I think I may need a slice or three!! Gorgeous! Three is how to do it!! What a lovely combo of Fall flavors! The pumpkin chai combo is one of my favorites this time of year! Love the pecan topping! So good together right?! Thanks Jessica! This is perfection! 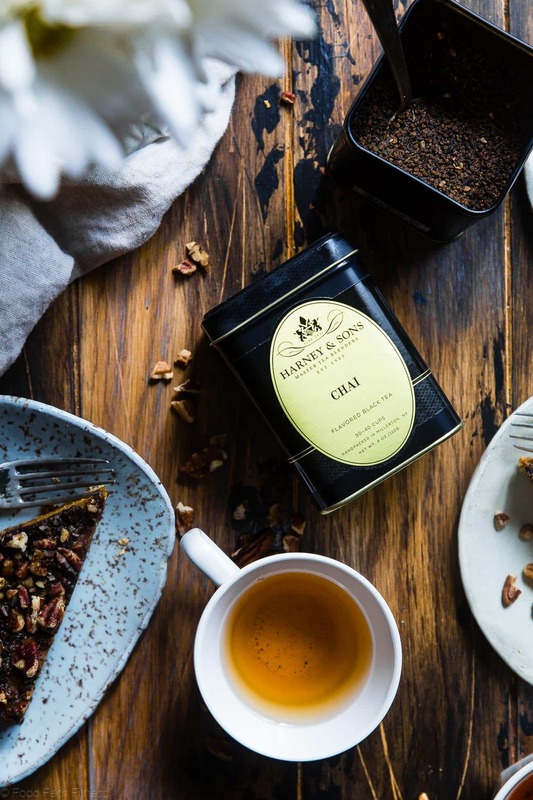 I love Harney & Sons teas…brilliant use here! This sounds so delish! Chai is such a fitting flavor for fall! Yes I totally want to sit in front of a fire in a cozy sweater with a giant piece of this! Loving the chia flavor…so yummy! And the filling looks so luscious and smooth! It is the smooooothest! I’ll join you in front of the fire! 😉 Thanks Laura! This looks so heavenly! I love the chai and pumpkin combo. I can imagine this is so creamy and perfect for fall, the holidays, and umm heck just for the heck of it! I always made raw cheesecakes until recently, everyone loved them so never messed with baking but I think the family is in for a real treat. I only started messing around since my oldest had to go dairy free too. While most was already dairy free the family had their favorites they still enjoyed because they could until we found out, she was a serious cheese, ice cream, and yogurt lover. HAHA YES to just for the heck of it! I totally feel your pain there. My husband is a SERIOUSLY dairy lover and also recently realized he is intolerant! Using cashews is a sneaky way to still get the cheesecake fix! I usually make a pumpkin swirl cheesecake for Thanksgiving. But this might be a new addition this year!! This is making me crave all things fall!!! Lol I could see that! Thanks Patrick! This is the best looking and sounding cheesecake ever! And I have seen a lot! What a creative recipe! I love that you used honey and chai in it, too. I have a feeling I’d be taste testing every layer as I prepared it! Haha I totally did! 😉 Thank you! So pretty and what a perfect recipe for fall! I’m booking this bad-boy. I am always looking for a dairy-free gluten-free dessert to serve dinner guests at Friendsgiving as we have friends who are allergic to both. This looks incredible. I am very intrigued by how you use cashews in this recipe. So lovely! It doesn’t get any better than this! WOW!! At my future wedding, I want to do something non-traditional rather than cutting a cake and smashing it in people’s faces! Breaking a donut sounds fantastic! Anyways, this cheesecake looks absolutely wonderful! The layers look oh so decadent and sweet! Breaking a donut was SO fun! You totally go do something a little unique! Thank you so much girl! Just made this and it’s delicious! I’ve only just recently gone dairy and gluten free and this was my first foray into GF/DF baking. My expectations were pretty low so I was pleasantly surprised when I really enjoyed it. Thanks! So glad you loved it Kayla!! I just recently had to go gluten and dairy free and this is the first dessert I’ve attempted since changing my diet. It was SO GOOD. I love pumpkin and chai everything and this totally hit the spot and took the sting out of my new food restrictions. Thank you! I am SOOOOOO excited to hear this! I remember the ‘sting’ when my hubs’ had to go GF and DF too! It gets easier, promise!